Posing a powerful challenge to dominant trends in cultural analysis, this book covers the whole history of the concept of culture, providing the broadest study of this notion to date. Johnson and Michaelsen examine the principal methodological strategies or metaphors of anthropology in the past two decades (embodied in works by Edward Said, James Clifford, George Marcus, V. Y. Mudimbe, and others) and argues that they do not manage to escape anthropology's grounding in representational practices. To the extent that it remains a practice of representation, anthropology, however complex, critical, or self-reflexive, cannot avoid objectifying its others. 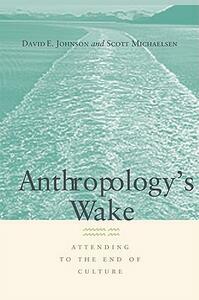 Extending beyond a critique of anthropology, the book reads the twinned notions of the human and culture across the long history of the human sciences broadly conceived, including anthropology, cultural studies, history, literature, and philosophy. Although there is no chance, they argue, for a "new" anthropology that would not repeat the old anthropology's problem of disciplining the other, they also recognize that there may be no way out of anthropology. We are always writing, thinking, and living in anthropology's wake, within its specific compass or horizon. Moreover, they demonstrate, we have been doing so for a very long time, since at least the beginning of the institution of philosophy in Plato and Aristotle.